Using long exposure, PhD candidate David Nadlinger took a photo of a glowing atom in an intricate web of laboratory machinery. 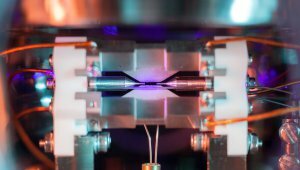 In it, the single strontium atom is illuminated by a laser while suspended in the air by two electrodes. For a sense of scale, those two electrodes on each side of the tiny dot are only two millimeters apart.